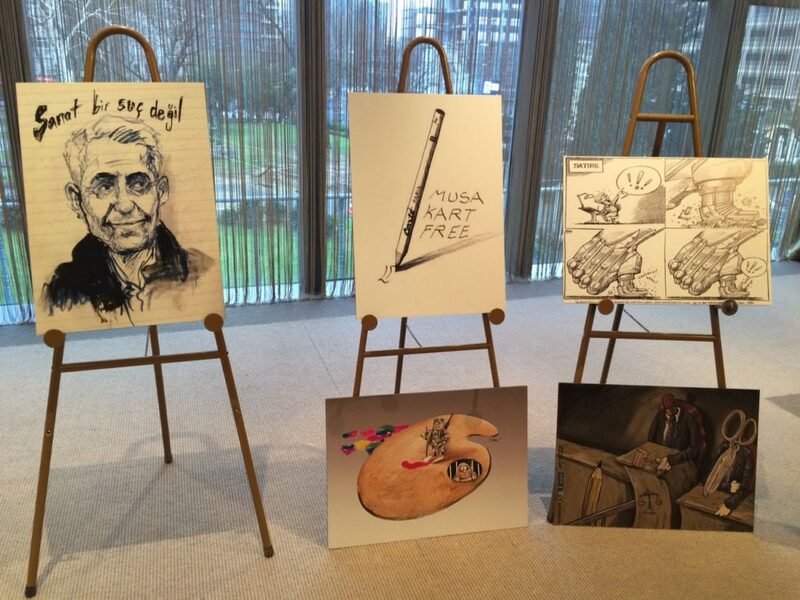 Turkish political cartoonist and Courage in Editorial Cartoon Award winner Musa Kart has spent his 100th day in custody after he and several colleagues from Cumhuriyet newspaper were arrested and charged with “crimes on behalf of the Fethullahist Terror Organisation and the outlawed Kurdistan Workers’ Party (PKK)”. The newspaper gave a detailed report on where things stood at the ninety day mark including the basis for the state’s case against the men, the difficulties their defence lawyers are encountering and the circumstances of their aggravated remand, including severely restricted access for visitors and denial of written communication via letter with the outside world which in Musa’s case also means he’s not permitted to draw. A further piece takes each of the paper’s reports or articles that the government contend amount to terrorism and refutes each charge. 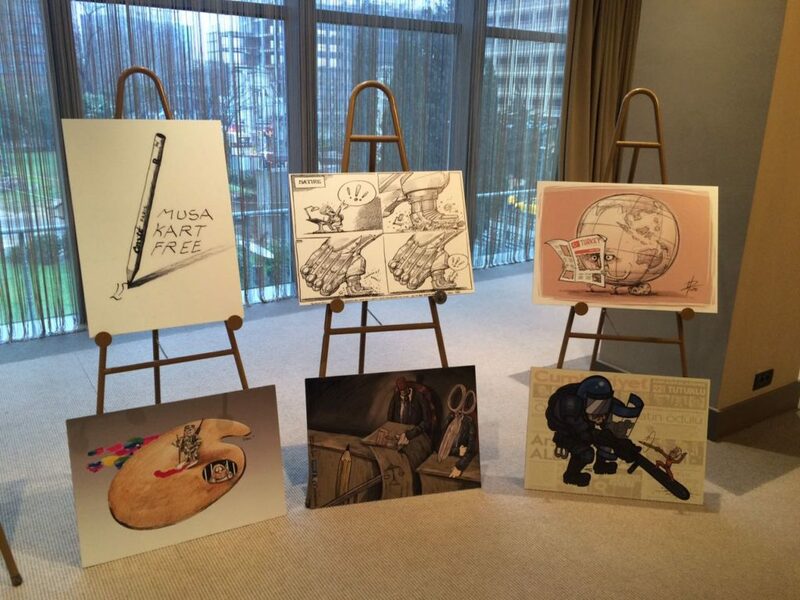 The list does not mention any particular cartoon of Musa’s that has prompted the accusations against him. However it is worth remembering that his is a board member at the paper. Also he’s been individually and unsuccessfully prosecuted by President Recep Erdoğan twice in the past on charges of slander. It would seem the opportunity is being taken to silence a critic of long standing. 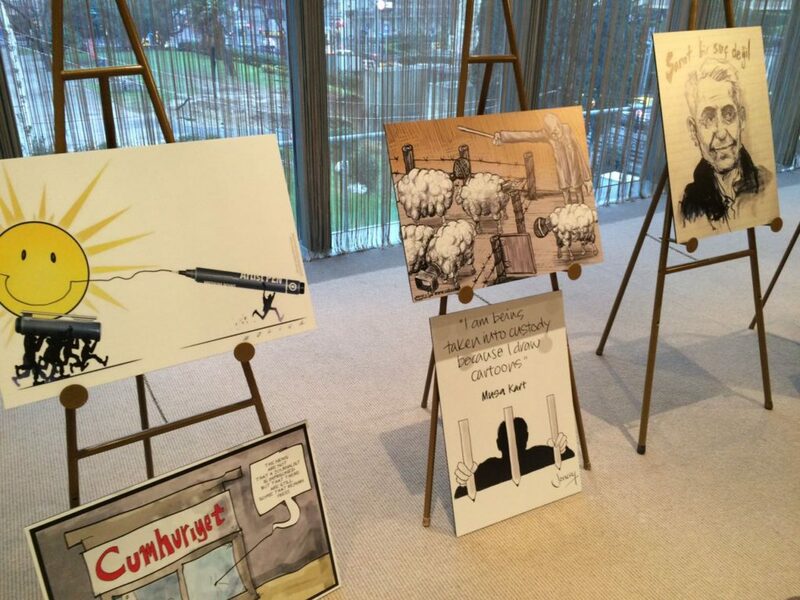 At a recent symposium on Freedom of Expression held in Istanbul, cartoons from around the world drawn in solidarity with Musa were displayed as a gesture of protest against President Erdoğan’s continuing efforts to suppress journalism and opposition politics in Turkey. CRNI was just one of a number of organisations who condemned the Erdoğan regime’s calculated attempt to silence Cumhuriyet and its staff. We call again for their acquittal and immediate release.